Ok, I’m changing my vision for reconnecting Tyler. In my post “Connecting the Dots: Intro,” I called for a loop of streets to be beautified with bike lanes, street trees as well as connected with street cars. My original vision saw the street car loop connecting down Broadway, but today I changed my mind. My imaginary Tyler now has a network of complete streets and a two-way street car loop. The map I have drawn (to the right) is the culmination of about a month of work on my Connecting the Dots project (C-T-D). It’s not a conclusion, but this is this skeleton that will be my foundation for future posts on infill development in Tyler. These developments are the dots themselves: The high-density nodes that should be developed throughout the older parts of Tyler. “The Loop” is the public investment that is necessary to make the entire concept a reality. In Tyler, we have certainly experienced this degradation of the quality of our civic life. There are few public gathering spaces. Just so we’re clear, Starbucks is not a public space, it is a private, money-making enterprise. There were once some incredible public spaces in the city, but many were destroyed or neglected … the downtown square is a sad example. Public space today is a scattered system of lovely public parks typically accesible by car. Our streets are often these large asphalt rivers running through the city with cars zooming by at deadly speeds. I drive one of these cars so I understand their utility, but I also understand the benefits of alternative transportation. The next stage in revitalizing this section of the city is the addition of a two-way street car loop. This will be an incredible statement of commitment from the public sector and will stimulate private investment at every point along the route. In my map (above) I have designated some locations that are prime for infill development. These typically have a ton of underperforming asphalt and outdated strip centers. The street car loop will be a convenient novelty for tourists as well as a viable commuting opportunity for a number of large employers along the loop. 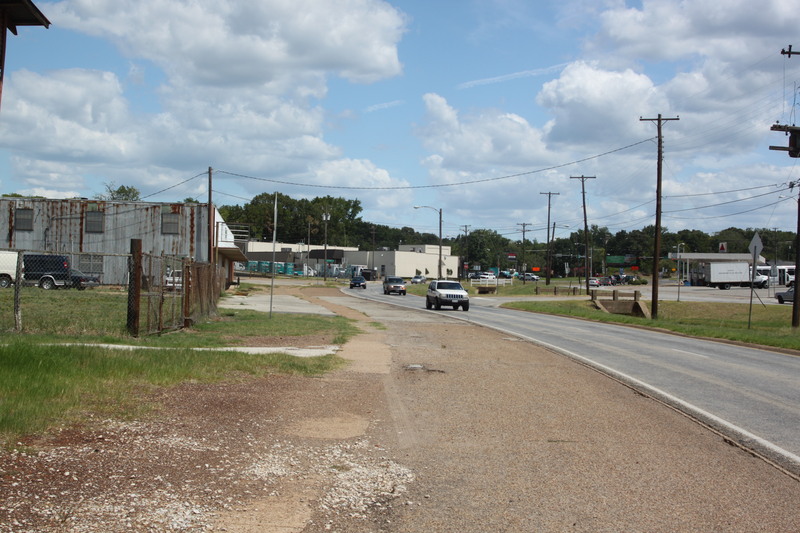 In addition, the street car loop will finally connect the parts of Tyler that are culturally, financially and historically significant: The Rose Garden, downtown, the hospital district, and the Azalea District. I’ll admit, the primary shortcoming of this loop is that it currently ignores the area north of the square. I response, I think that Broadway should be “completed” all the way to Gentry (banner photo of this post) which should also be retrofitted with bike lanes and street trees all the way to the amazing Caldwell Zoo. If you haven’t driven on Gentry lately you might not know how big that street is … it is due for a full retrofit. So this is my “Complete Loop.” Unlike the car loop (323), it’s beautiful and versatile and it invites everyone to come and enjoy. Check out my other Tyler projects at my Tyler, TX page. *I also had a policy thought: Developments and businesses along The Loop would be exempt from zoning laws that require on-site parking. Instead, public parking would be provided at points along The Loop to encourage a “park-and-ride” system. Look at the image below. What do you see? The stem of the rose (S. Glenwood Blvd.) extends as a greenway belt from the bottom left corner toward the upper right. It curves along the stream in between the grass of the greenbelt. At the end of the stem, there is a parking lot in a shape that resembles a flower bud. It seems like a perfect fit for the Rose Capitol … especially considering it’s in The Rose District, my fictitious plan for the area of land around the Rose Garden Complex. The Rose Park would be the perfect way to say, “Welcome to Tyler, we like roses a lot.” Since we pretty much control the commercial rose industry in the USA … I’d say roses like us too. The Rose Park is the perfect way to welcome visitors into this city that has been celebrating the rose industry for decades. As you drive into Tyler on Glenwood, the road is suddenly transformed into a tree-lined parkway with a creek running down the middle of it. Brick sidewalks run along this parkway as it wanders past the junk shops and the Cotton Belt Building. The sidewalks of this parkway then ends with a crosswalk across the intersection that has been rebuilt to accommodate a larger number of walkers and bikers. The bike/ped crossing leads across the intersection into the parking lot that has been transformed into a park of flowers. From the sky, the stem and rose form a clear picture of the city’s identity. From the road, drivers get a glimpse of the park and begin to feel like they have formally entered Tyler. 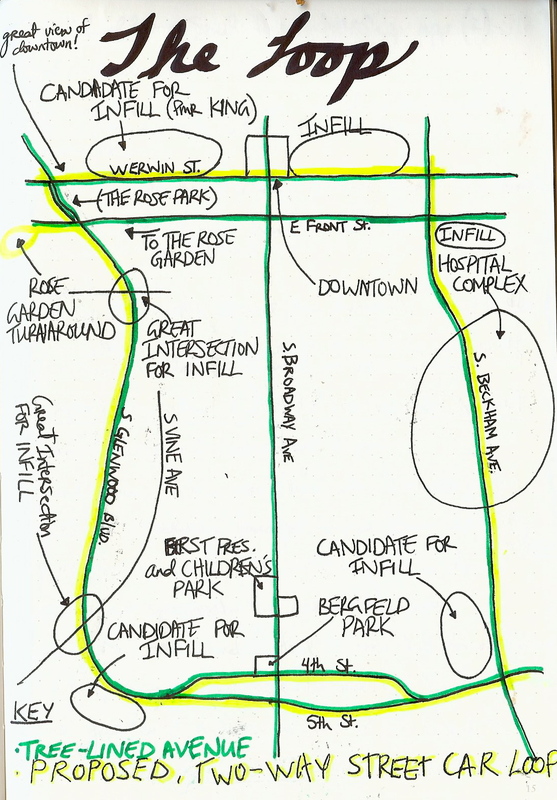 The Rose Park should be a part of a bigger network of trails and parks in the Rose District. These would all make this an area of the city that is accessible, functional and proud. In it’s current form, this is just a road and a parking lot. But in a few years it could be a purposeful use of space and an excellent entry to this city.